Theory is known for their amazing wardrobe staples (like this adorable black + white shift and this classic silk blouse), but they don’t get nearly enough recognition for their more fashion-forward pieces. Flattering fits join together with fun prints to make the best seasonal pieces that end up being worn year after year. While shopping in NYC, I picked up these pants – they’re a little edgier than the typical Theory pants you see, but still sophisticated enough for the office. This shirt is also a gorgeous fit, but with fun inverted pockets matching the print on the back. Finally, I just bought this sweater over the weekend during their Friends & Family sale – grid prints are huge for fall/winter! Also, I may be later to the game on this one, but have you checked out Theory 38? It’s a more casual, sporty line they developed this year. I love this laminated knit sweatshirt and these printed running shorts. Talk about gym chic! 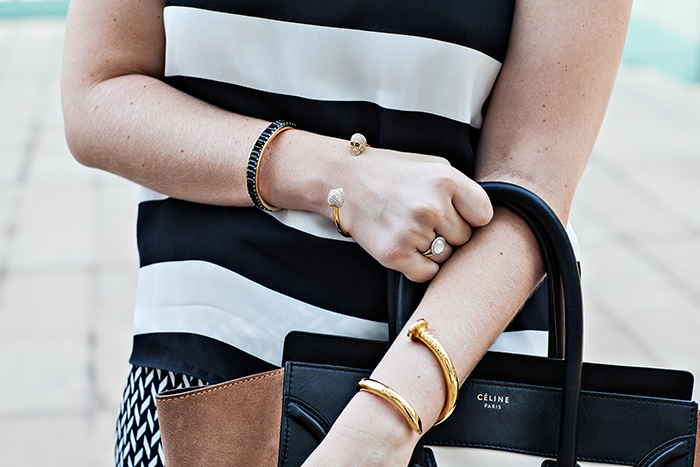 love this print mix and it’s perfect that you kept the same color scheme. I saw this on Instagram & knew I would love it! Perfect print mixing – this looks so comfy but still so chic! thanks Kimberly! I’ll definitely be wearing these pants all fall! Love the mix of prints! Great pair. OMGOSH. What I would do for that bag!!! Gorgeous in any print, i love how loose the pants are. 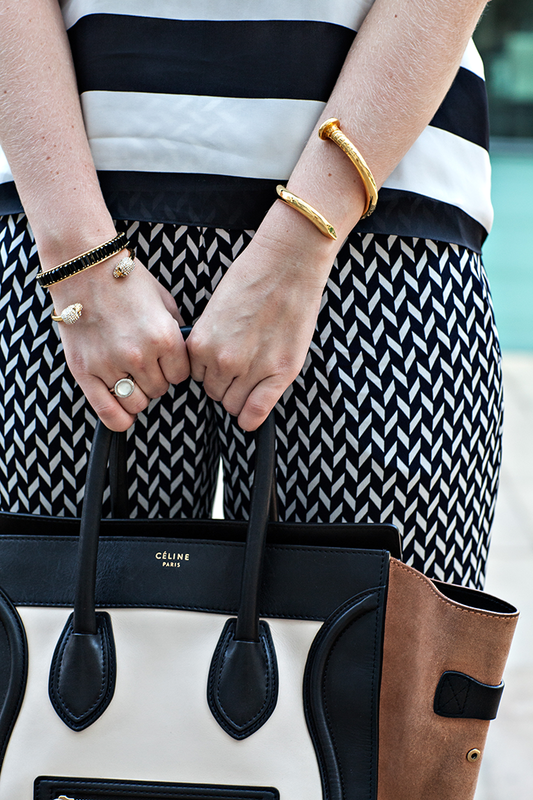 Love your mixing prints! This outfit is fabulous. Those pants are amazing! Love this print mix! So cute! love the pattern mix and the sunnies!!! and of course the nail bracelet kills me every time you wear it. Its so beautiful. what a fun outfit! lovely as always girl! you look great! love how you did the print on print trend! Love the mixed prints! It definitely works well with the same colors. Love this! I can’t get enough of print on print this season! Love these prints together! And your bracelets. I am obsessed with these pants on you! They look amazing!